For the 30-year old Cambodian activist, an arrest is a very real possibility. Several of her colleagues have already been thrown in prison for their work, being released only after months in overcrowded cells in the one-party state. Aware of the risks, not many people were willing to become active, Kimsor said. She started her environmental activism in cooperation with Non-Governmental Organisation (NGO) Mother Nature Cambodia in 2013, before joining them as staff volunteer in 2017. A team of under ten people in Cambodia, Mother Nature is one of the most well-recognised grassroots movements in the country that fights to stop the destruction of natural resources. Following intimidation of civil society and harassment of two of the co-founders of the organization, Prum Thomacheat and fellow monk Sok Chantra, the Mother Nature team asked to be struck from the NGO registration list and was officially dissolved in August 2017. Despite this, the members continue to document companies’ illegal activities. Mother Nature received international attention when they exposed massive corruption in the sand dredging sector. After uncovering that Cambodian sand export records did not match Singaporean import records, Mother Nature launched a campaign that resulted in the banning of construction and mud sand exports from Koh Kong, a province in western Cambodia notorious for sand dredging, in 2016. Singapore reported having imported more than 72 million tonnes of sand from Cambodia since 2007, while Cambodian government figures displayed just 16 million tonnes. “When they dredge sand, the natural resources under the water are destroyed. For example fish, crabs and everything in the sea, [the villagers] cannot find them anymore,” Kimsor explained. This means that locals are not able to make a living off fishing anymore. Some of them are forced to leave their villages in search of a new way to make ends meet. According to the activists, sand dredging continues despite the ban – albeit on a smaller scale. 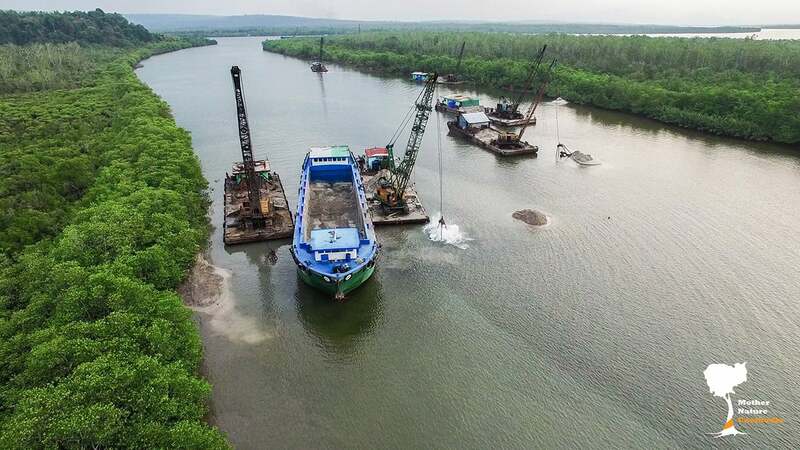 Kimsor says she and other volunteers went to a site in Koh Kong province in November after being alerted by the community that a company was dredging illegally. When the activists came back to the scene two days later, the equipment had disappeared. “They had moved to another location,” she said. Kimsor believes the sand dredgers will likely never have seen consequences for their illegal activities. “Some companies are illegal and pay money to the ‘power people’… to protect their business. It’s corruption,” she said. And while local communities only earned small wages when working for the companies, the latter enriched themselves on the exploitation of the resources, Kimsor said. She estimates that a company could dredge about 100 tonnes of sand in one day. Meanwhile, those who uncover those illegal activities might face severe personal consequences. “They never protect us, but they protect the company,” Kimsor said of local authorities. Companies paid local authorities, she said, not only to tolerate their acts but to stand guard at their locations – even when they were illegal. Kimsor herself, after releasing a video calling on Cambodians living abroad to protest to ask the European Parliament to put pressure on Cambodia’s Prime Minister Hun Sen, received arrest threats. San Mala, a former Mother Nature activist, is one of the environmental defenders who has been arrested for his activism. During Transparency International’s Anti-Corruption Conference IACC in October this year, he told the audience about his experience. Shortly after, the activists saw themselves behind bars. “We were arrested and sent to prison, and were detained for 10 months and 15 days,” he recalled. After being released, he said, they changed their strategy and started investigating sand export statistics – which, in turn, led to the banning of sand dredging in the region. “So this is our success story,” he said. But the arrests of activists, said Mother Nature co-founder Gonzalez-Davidson, had profound impacts on the work of the organisation. “Cambodian jails are, mainly because of systematic corruption, essentially centres of torture. There is never enough food, water or space to move inside the cells. There are never enough guards on duty or enough infrastructure to allow prisoners to leave their cells. There is never enough medical attention so health problems are rife,” he said.